Saint-Gobain Indonesia, one of the largest building materials holding company in the world, always strives to help advancing construction and material industry in Indonesia. As a follow-up to the commitment, Saint-Gobain Indonesia opened a booth in Megabuild for the first time. The convention was held on 14-17 March 2019, in Jakarta Convention Center. 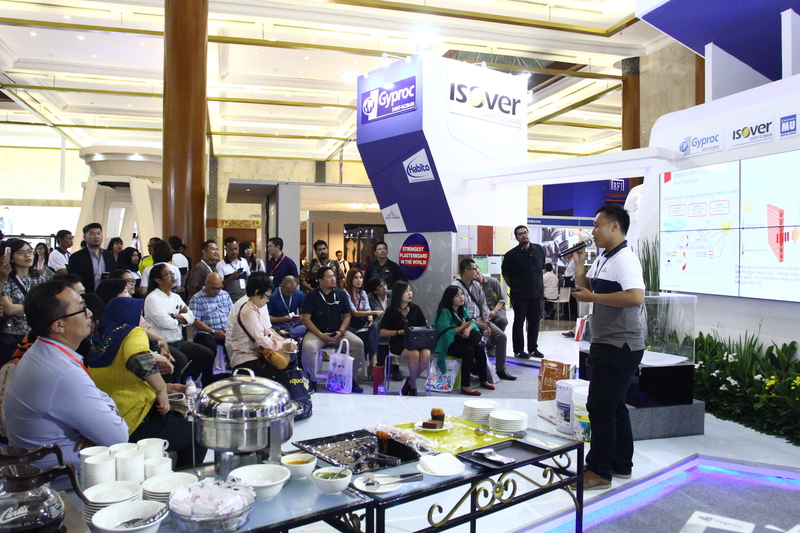 Alongside MU-Weber, gypsum factory Gyproc, and insulation factory Isover, Saint-Gobain Indonesia’s booth introduced innovative products and increased visitors’ knowledge. As a result, Saint-Gobain Indonesia’s booth was awarded “Best Booth”. One of the activities in Saint-Gobain booth is the announcement of new, innovative MU-Weber Products, such as MU-Weber 110 – ColorFacade, MU-Weber Epoxy Floor Coating Product Range, Gyproc ThermaLine, and Gyproc ProStick Drywall Adhesive. Those products are aimed as solution for business and property owners to build strong, high-quality buildings. To inform customers more about instant mortar and gypsum, MU-Weber and Gyproc also open product consultation session. Customers can ask about product usage and suitable application. Moreover, customers can also directly buy MU-Weber products via Blibli.com e-commerce platform. It is impossible for Saint-Gobain Indonesia to create innovative products if the company is not supported by various external parties. As a token of appreciation, Saint-Gobain Indonesia’s CEO, Jose Martos, also visited the booth and gave awards to architects using MU-Weber in their projects. Aside of product exhibition and consultation, Saint-Gobain Indonesia also ran entertainment programs in the booth, such as Tukang.com session, kids’ coloring contest, and photography contest with various great prizes. Through Megabuild, Saint-Gobain Indonesia strive to contribute to the growth of Indonesian construction industry.